Hostal Y & Y is a beautiful family house in Trinidad. Thee air-conditioned rooms are rented, with spacious and comfortable beds, with a maximum capacity of 3 guests in each. In the patio of the house, you can enjoy the tasty meals offered by the hosts. There is Wi-Fi service inside the house. Yail, an electrical engineer and Yisel, a solicitor, are the ideal hosts for a trip to the Caribbean villa museum. For your English language proficiency, your knowledge of local history and the best attractions in the city can recommend places and facilities where you can enjoy traditional Cuban music and drinks. They manage reliable guides for excursions, horseback riding, diving, taxi service, bicycle rental and many more options for the enjoyment of your stay. The fixed telephone of the house is provided free of charge to the clients for local calls and for the management of the next destination, besides the possibility that it can make international calls. 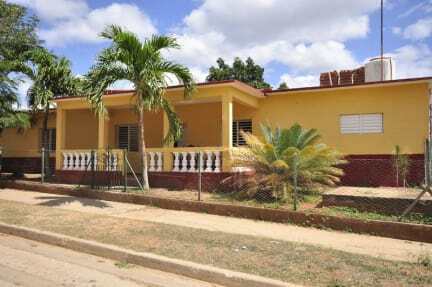 The house is located in front of the Immigration Office of the city, only 10 minutes’ walk from Parque Céspedes. We offer 3 comfortable private rooms with private bathrooms. Air conditioning, wall-mounted fan, table with lamp between beds, 2 windows. 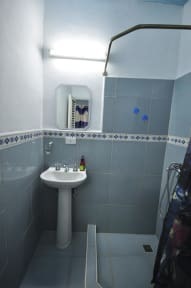 Private bathroom with shower with hot and cold water, hair dryer, soap, shampoo, towels and toilet paper provided.